Wendy Williams Just Scared EVERYBODY When She Passed Out On Live TV! Here's Her Statement. Talk show host Wendy Williams was about 48 minutes into her live Halloween show today when things suddenly took a turn. 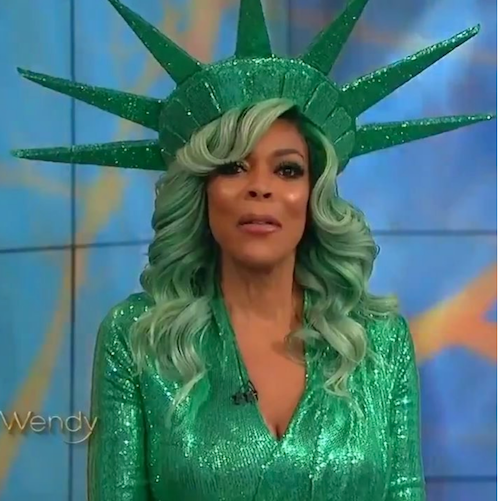 Right as she was introducing the audience costume contest, dressed as the Statue of Liberty, she jumbled her words saying "caress" instead of "guest". She suddenly looked extremely frightened, and passed completely out. The show quickly cut to commercial as producers scattered to help her. A super scary moment just happened on #WendyWilliams show. She got overheated in her #StatueofLiberty costume and passed out on live tv. She finally came back to address the audience and confirmed it was NOT a stunt. It was unclear if it was a stunt or part of the Halloween show (she had earlier said one of the costumes in the audience was too scary and she didn't ant to see it again and made it clear she hated Halloween). When Wendy returned after several commercial breaks, she confirmed it was not a stunt. She revealed, "I was overheated in my costume and I did pass out. But I'm a champ, and I'm back." There wasn't time to finish the costume contest and Wendy asked if she was passed out for that long. We hope "overheating" is all it was and she's ok. Get well soon Wendy!